IN his continuing search for the more weird, wacky and wondrous in the world of travel, David Ellis says that Alice Springs has been ear-marked to become home to the first major "aircraft boneyard" outside the USA. It will be similar to those in the deserts of Arizona and California where old planes that have passed their use-by date are parked until being bought up and recycled as scrap, or broken down into spare parts. Airlines and armed forces dump literally thousands of aircraft a year – from tiny single-seaters to jumbo jets, fighter planes, bombers and helicopters, and dry, non-corrosive desert country is ideal for storing them as they await their fate. Asia Pacific Aircraft Storage (APAS) will open the Australian "boneyard" early next year on 100 hectares of the 3500 hectare Alice Springs Airport. It will store aircraft that may be temporarily surplus to airlines' needs, or have been decommissioned awaiting scrapping or stripping for their parts. 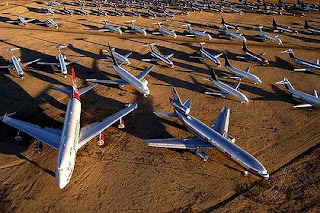 In the past such aircraft from the Asia Pacific region have had to be ferried at high cost to Arizona and California for storage in their deserts, where some of the larger "boneyards" can be home to over 4000 aircraft each.